Newt, an overweight, 9-year old male/castrated Labrador Retriever was evaluated for chronic hindlimb weakness. 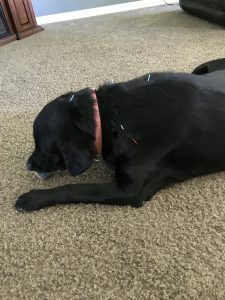 Newt received three acupuncture treatments in about a three to four week period. This was a difficult case, as no diagnosis was obtained, partly due to lack of diagnostics, in which the owner declined. The treatments were tailored to the limited examination and myofascial palpation each day. The treatments targeted multiple trigger points and tenderness in the front limbs, pectorals and shoulder regions for Newt. There were some small successes in that trigger points appeared to be relieved with treatments. Overall, it would have been nice to have more diagnostics, but at minimum some oral pain medication to help get ahead of the suspected wind-up this patient is experiencing. 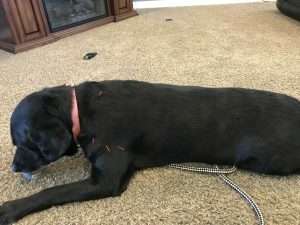 Newt is an overweight, 95 pound, 9-year old male/castrated Labrador Retriever that presented for concerns about helping with hindlimb weakness experienced over the last year or two. Newt can no longer jump in and out of the pickup and falls down on hardwood floors easily. Newt is a companion animal that has a housemate dog and spends most days in a fenced backyard. Newt is currently on Cosequin and fish-oil capsules daily. No recent bloodwork has been obtained but appeared normal within the last year according to the owner. Newt has not had any diagnostic imaging to help evaluate possible causes of the chronic weakness. The owners are not interested in further diagnostics but would like Newt to be comfortable if possible. Newt was a difficult patient to assess, this is a dog that gets very excited when people come to the house, particularly me. Three examinations and acupuncture treatments were provided for Newt over a 3-4 week period. Newt has not experienced any trauma as an adult, but he did fall out of a pick-up when he was about 4-5 months old. According to the owners, there were no obvious issues following the fall at that time. Physical examination, bright and alert and very excited, overweight with a body condition score (BCS) of 4/5. Moderate tartar calculus and mild gingival inflammation. Mild brown waxy debris in both ears. No apparent abnormalities auscultated within the thoracic or abdominal cavities. No apparent abnormalities palpated in the abdomen (although, Newt did not tolerate palpation very well). Gait appears ataxic in the hindlimbs with majority of weight being placed on the front limbs and the hindlimbs adducted toward midline when walking. Moderate symmetrical hindlimb muscle atrophy. Examining Newt was very limited due to his easily excitable behavior. Palpation and myofascial palpation overall, was difficult. Newt appears to have majority of his weight on the front limbs and has an ataxic hindlimb gait, sometimes the back feet crossing. Neurologic examination revealed apparent positive crossed extensors of both hindlimbs and no apparent conscious proprioceptive (CP) deficits, all other reflexes appeared normal. Although CP’s were difficult to assess as Newt does not appreciate feet being touched and attempting to support his body while manipulating his feet became challenging, (which also had me question the positive crossed extension of both hindlimbs, but that reflex appeared repeatable). I suspect Newt is dealing with a couple of issues. Observing Newt’s gait and given the history of a gradual hind end weakness and not being able to jump up or into things like he had in the past has me highly suspicious of bilateral hip dysplasia. I think it is bilateral due to the symmetry of hind end muscle atrophy and gait observation. Radiographs of the thoracic spine and of the hips would help with the diagnosis. My initial approach with Newt was to try and address his excitability. I wanted to try and calm him down, with the hopes of maybe being able to further palpate or evaluate. I intially, wanted to try one to two treatments in the first week, Newt is not an active dog per-se and I did not want to overwhelm with examination and treatment with the first treatment. 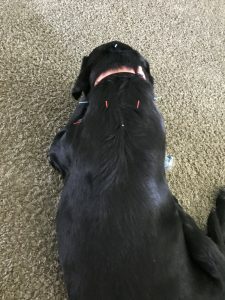 This was Newt’s first ever acupuncture treatment, my goal was to utilize calming points and address the tense shoulders and chest. Governor Vessel (GV) 20 was placed first and given a few minutes before the next needle was placed, Bai Hui was placed next. Newt predominately was laying on his left side so only points on the right side were utilized. Gall Bladder (GB) 21 and Large Intestine (LI) 15 on the right were placed (these areas addressed the taut bands felt during the myofascial exam). Newt eventually moved to a more sternal position and I was able to place Bladder (BL) 27 on the left and right. Newt was reactive with any movement, so I had to be very slow and intentional with my movements and placement of the needles, which proved a bit difficult, as I was really trying to focus on the anatomy and palpation and proper placement of needles. Overall, Newt was not as reactive on palpation in the front end, he still did not tolerate much on the hind end following this treatment. Needles used were Seirin J Type 0.20 x 30mm (I started with 0.16 x 30mm in GV 20 but it fell out immediately, so then I used a 0.20 x 30mm and continued with the rest of the treatment with that size). This treatment I thought about my first treatment and thought I used too big of a gauge of needle and decided to try a smaller gauge for this treatment to see if that would help. I also utilized baby food for this treatment and I am not sure if it was the smaller needle, the baby food, the previous treatment, or all of the above that helped with this treatment. I felt that this treatment was the best as far as being able to address multiple areas. Newt was still reactive in the hind end on palpation, pre-scapular region was not as tense as previous treatment. This was the third treatment for Newt, it was a few days past what I had in mind for his next treatment, but that’s how the schedule worked out. Newt was again excited and I found similar reactions points as previous exams. However, I felt that in the front end his shoulders were not quite as reactive as they were during the second examination. The successes of this case were minimal. The first treatment did alleviate some tension and trigger points in the pectoral and shoulder region, which was nice to appreciate. I was going to use a jar of baby food for the first treatment, but this dog gets so excited when I am there that I thought that would make the excitement worse. However, I chose to utilize the jar of baby food for the second treatment and was able to get a little better myofascial examination and treatments. 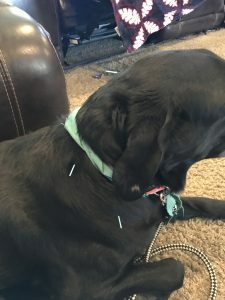 The third treatment, Newt was focused on the jar of baby food but was also aware of my attempt at a more thorough myofascial examination that he would move his body away. I chose not to move forward with the examination and just address the areas that I was able to with my initial examination. I wish I could have helped this patient more, but it is difficult when the owners do not want to pursue diagnostics to help address their concerns with their pet. This was a difficult patient as his excitement level was very high. It was difficult to determine whether it was excitement versus chronic pain that prevented me from being able to thoroughly palpate and evaluate Newt, particularly in the hind end. I am still lacking in my neurological examinations and I questioned my evaluation of the crossed extension reflex of the hindlimbs. I could tell that addressing the areas that I did with Newt did help, as you could palpate him and pet him without him flinching or wincing as much on the frontend after the treatments. I was a bit discouraged that a couple of my points that I placed did not help as much as I would have liked them to have with the anxiety and/or excitement that Newt exhibited (possibly it was a placement issue, although I did try and adjust the points). I think Newt is a prime example of utilizing a multi-modal pain management approach and that it is obvious one modality is not going to help with such a case.